i finished this one up this past weekend. i pieced the back to avoid buying fabric, and i am glad i did. available in my etsy shop. Oh, Nettie, it's just beautiful! How can you possibly part with your lovely quilts? I love it! Congratulations! I read your blog from Spain and I love your quilts. Thank you for showing them. 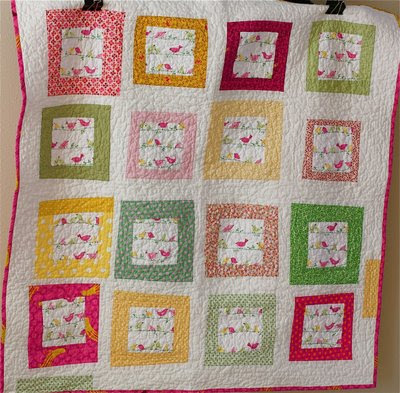 Nettie-this quilt is fabulous! And I love the pieced-back. Also very fun to see some of your other quilts in your last post too. I love them! As usual, beautiful!! Love the extra little bits of color on the front. great quilting on this. Love it! How cheery. I love the colors. They bring so much warmth in this cool weather. Cute quilt! Do you machine quilt or hand quilt these quilts?? I *adore* it! So pretty! I just can't get my hands on that Penelope birdie sheets - the PBKids website wants a TON for shipping... I want some to go with the new apple fabrics I have picked out for a quilt for my princess! Great job on the quilt! Love it! It's lovely! So bright and cheery. whoever ends up with this quilt is very lucky! That is the cutest quilt ever!! I love the birdies and all your fabric choices! Love it. I love this quit. the fabric is great, at some point I may need to make one with that fabric. It is soo darling. love how it turned out! i think your fabric choices on this one is just perfect. especially the little birdies! I love this quilt. 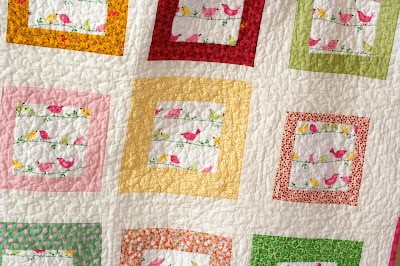 That bird fabric is so cute & the pieced back looks great. You did a super job! girl, you do know how to showcase fabulous fabric! i adore this quilt. oh, nettie! you've outdone yourself. the quilt is adorable! the back is perfect, too. Oh! Love your site! You've got me wanting to pull out my fabric now! I love all your quilts! this one is especially gorgeous! So sweet! I love how you've made a showpiece out of that cute birdie print. I don't think I could part with it! This is stunning. The quilting just makes it! ooohhh! Love it...just darling! Who makes that darling bird fabric! Do you happen to know? I wonder if it comes in greens and blues...have a little person to make a bumper set for and this is the correct direction and all! Just an adorable job. 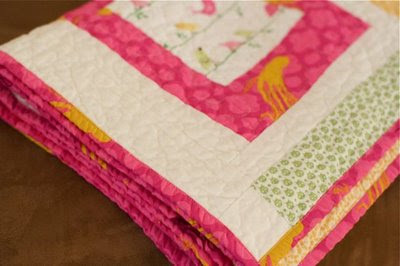 Your quilting is just the kind I like...giving it that old fashioned look with modern fabrics! Excellent quilt! Sweet birds! Where did you find the bird fabric? What took me so long to find your blog??? This quilt is beautiful, thank you so much for sharing. I will be checking back often. this is simply gorgeous! i luv it, omgosh! so simply perfect and comfy. I found you blog via tutti fruiti. All of your quilts are so lovely and fresh...but I simply adore this one. 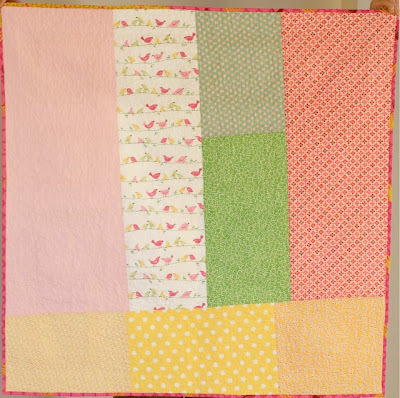 The bird fabric is so gorgeous and the colours you have put with it are perfect. wow, I've just discovered your blog and am having a lovely wander through your posts - your work is beautiful! i'm wondering what the name is of the birds on a wire fabric is in this quilt? I may be way too late but it is stunning and i'd love to get my hands on some!